Huntington Beach is the place where the Santa Ana River makes waves – quite literally. Part of what makes Surf City such an excellent place to catch a wave is a sandbar created by sediment flowing from the Santa Ana. People have gathered here to surf and enjoy the SoCal lifestyle for decades, and Huntington Beach is still a great place to come to relax and soak up the sun. The culture of this particular beach makes it a perfect destination to bring your kids for a day of fun. Pack up a cooler full of cold drinks, your lounge chairs, beach toys, boogie boards, and your beach umbrella and camp out for the day. 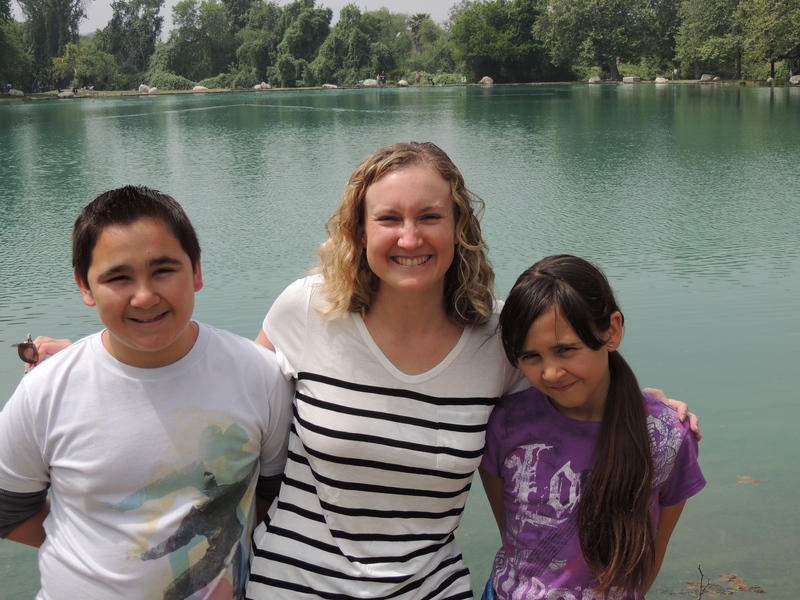 My niece Emily and nephew Hunter had a great time playing in the surf and dipping their feet in the river. 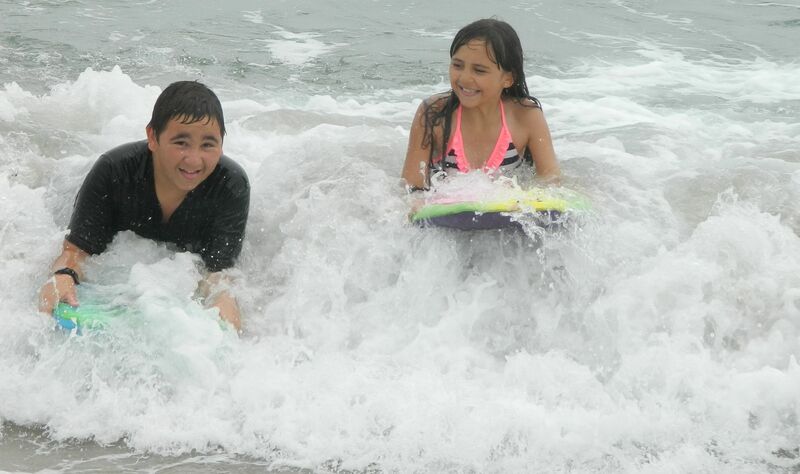 Once they started riding the waves on their boogie boards, it was nearly impossible to get them out of the water. Surries are great fun – but be ready for a workout! 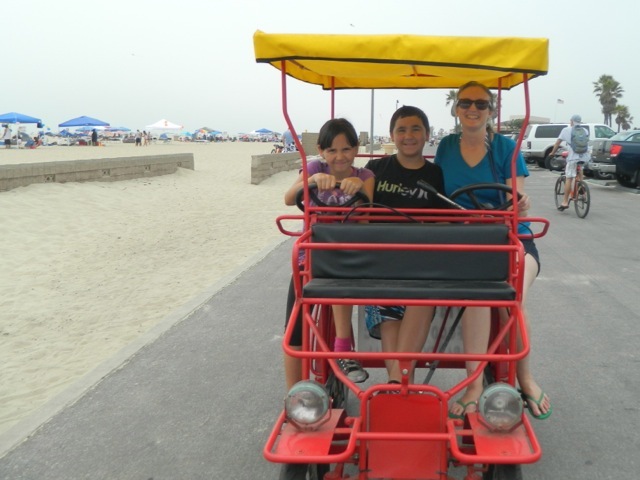 We took the one with room for two and I had the kids switch out between peddling and resting. Emily had a great time pretending to “drive” with the dummy steering wheel. Surries are a great relationship builder if you are looking for a workout and don’t mind joggers passing you. Emily’s favorite part of the day was getting to dip her feet in the Santa Ana before we moved over to the Pacific side of the beach. Families set up camp along the river’s edge – some even set their beach chairs right in the shallows. Kids can wade in shallow water without waves overwhelming them. The river’s currents are strong, though, and can go out to sea or back toward land depending on the tides. Don’t let kids go too deep. This is a place for strong supervision. The Santa Ana River is Southern California’s largest and most-used river and supplies water to millions of people living in the Santa Ana’s watershed, which extends from the Inland Empire to Orange County. Its headwaters are high in the San Bernardino Mountains, stretching from Mount Baldy to Big Bear. Snowmelt from these mountains and rain from around the watershed feed the Santa Ana and its many tributaries. One of the coolest things about this watershed is that most parts of it are within easy driving distance – you can ski in the mountains, drive through the desert, and play at the beach all in one day. If you don’t know how to surf, you can still enjoy Huntington Beach’s legendary waves. 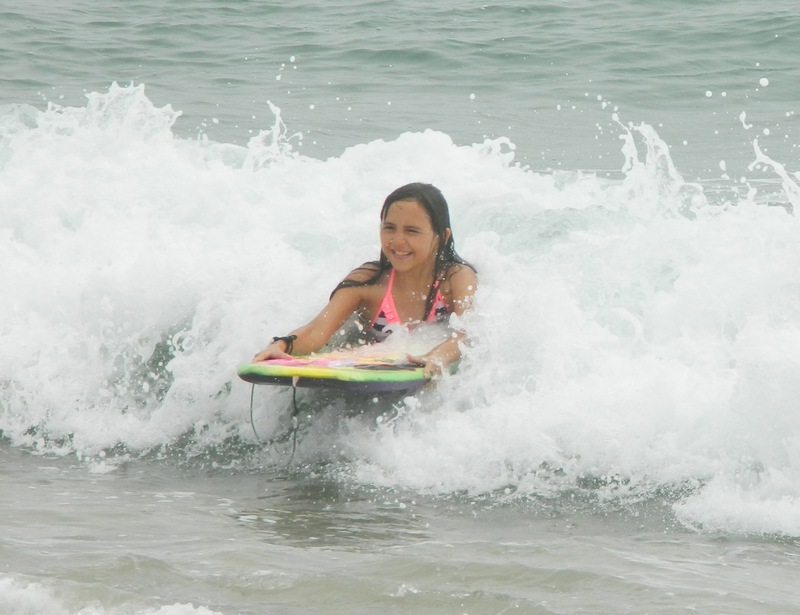 Boogie boards are incredibly popular – the shallow surf is full of kids swimming out and riding back. 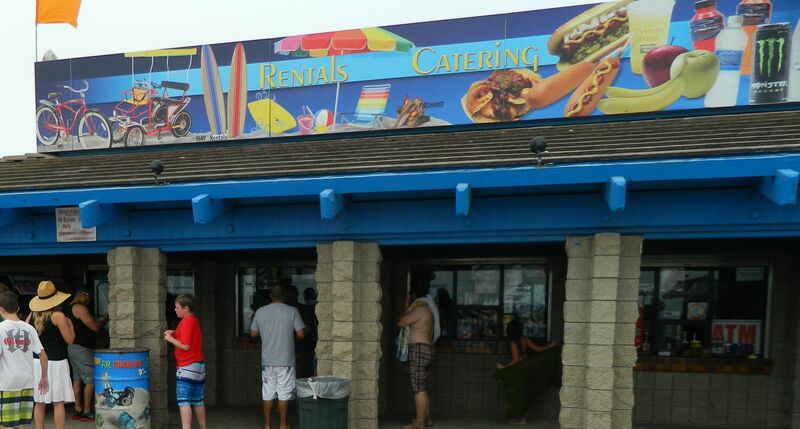 If you don’t own boogie boards, they can be rented at the snack shops that dot the beaches. Emily and Hunter spent the better part of three hours in the water, fighting their way out and careening back to shore. Now would be the time to dust off any footballs, volleyballs, or even badminton sets you have in the garage. Any kind of beach sport you can think of is more than welcome at Huntington. No one seems to mind if a ball goes flying towards another group’s setup – it’s almost expected. Bring your tailgating gear for a feast on the sand. One of the most clever setups we saw was a family that fit a giant cooler into one of those collapsible red wagons. 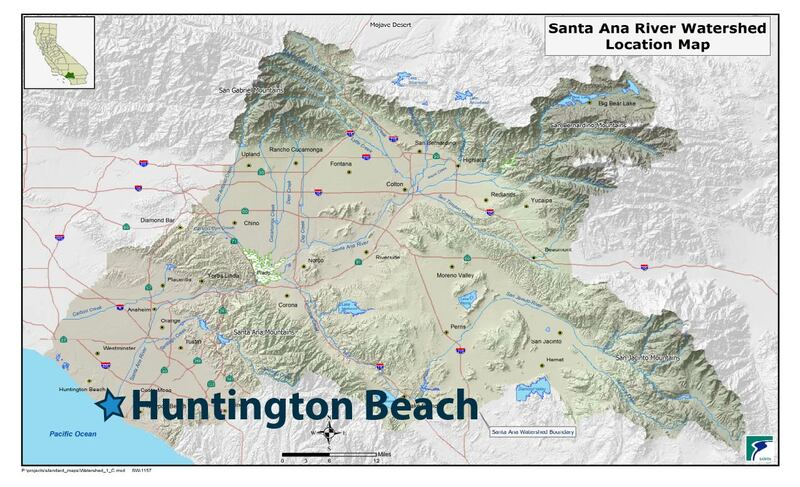 Huntington State Beach is located where the Santa Ana River meets the Pacific Ocean. The Santa Ana’s Headwaters start high in the mountains that surround the Inland Empire, including places like Big Bear. The snow we play in all winter eventually makes its way down to Surf City, where it runs into the Pacific. The Beach is situated next to the Pacific Coast Highway, west of Magnolia Street in the City of Huntington Beach – click here for directions from the California Department of Parks & Recreation. Parking is $15 for the day during the summer and $10 a day from October 1st through March 31st. Come early for the best spots. Huntington Beach is where the Santa Ana River meets the Pacific Ocean.